This 4 star meal was really quite good, the second time I made it. The first attempt was a disaster cause I tried to use the low fat & low sodium soups, which caused the dish to come out with no tastes what so ever. Before deciding to try this meal I had read all the reviews, and out of 12 reviews only two were negative. One stated what it was tasteless, and the other complained it was to salty. My advice is know your slow cooker, know how fast it cooks. 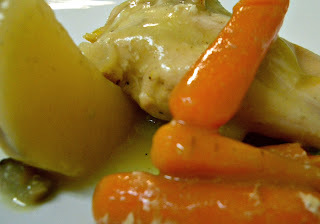 Mine cooks fast, this meal in my cooker was done in 5 hours ( recipe suggests 8 hours). Second don't make the mistake of using low sodium or low fat soup. The chicken came out tender and with a perfect texture.When buying my chicken I did asked for the chicken breast directly from the butcher, not wanting the pre-packaged chicken out of the freezer case. This meal is really worth a try, and I would definitely made it again . 1. place potatoes and carrots in a 5-qt slow cooker. Top with chicken.Combine soups with garlic salt; pour over chicken. 2. Cover and cook on low for 8 hours or until meat and vegetables are tender.To thicken, stir potato flakes into the gravy and cook 30 minutes longer. also I used russet potatoes instead of the red potatoes, and baby carrots. I love slow-cooked meals! Thanks so much for linking up with "Try a http://our4kiddos.blogspot.com/2013/11/try-new-recipe-tuesday-november-12.htmlNew Recipe Tuesday." Hope you will be able to join us again this week. I love slow cooker meals too! 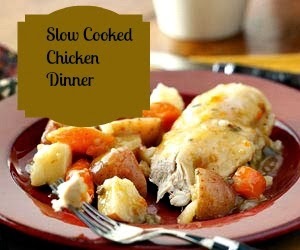 I typically make 1 to 2 meals in my slow cooker every week, it's so easy! Thanks for the new recipe ideas! Thanks so much for sharing at our Mommy Club Resources and Solution Linky Party! I love slow cooker meals also. Yours looks delicious! Thanks for linking up at Saturday Dishes "CROCK-POT" blog hop. I am a firm believer in having variety especially in the meat we eat. My husband on the other hand would love to have beef and bacon only. He claims to not like chicken. This would be a great way to serve chicken that he might like. I know I would love it. Thanks for sharing at Saturday Dishes.